I haven’t read a book like The Dinner before. The story rolls along at a slower pace than I’m familiar with but it was comfortable and fit the vibe of the book. The Dinner is narrated by ‘Paul’, a husband and father, and brother to a candidate for Prime Minister. All of these roles are tested in this book. The book begins, and continues to take place at a formal dinner in a high end restaurant in Amsterdam. Of course there are the informative flashbacks that help to create the narrative for two families and one fateful night, but Koch manages the transitions cleverly and smoothly. Sometimes narraters are neutral parties to other characters in the book but not in this case. Our view of the story and the characters are biased thanks to Paul’s experiences and opinions. His brother is obtuse and egotistcal. His wife is the love of his life and can do no wrong in his eyes. Their son Michel is their only child and they will always stand by him, no matter what. It’s this way of thinking and parenting that makes for a story of loyalty, deviousness and consequence. The tone is dry, with a slow build. I have seen reviews of The Dinner calling it “dark”, “shocking”, “provacative” and “tremendous”. I think “dark” is a good word to describe The Dinner but “shocking” may be going too far. In a world where the nightly news is full of real darkness and shocking headlines, I was a bit disappointed after hearing all the hype. It was still a good read and I found it interesting to read a book that had been translated to English from it’s native Dutch. I enjoyed the pace of the book and if you’re a fan of conversational as well as strong descriptive writing, then pick up a copy of The Dinner. The moral questions it proposes are interesting and unfortunately relevant in this world we live in, full of school shootings, bullying and questionable consequences in our present day societies. I would advise this title if your book club is looking for something that isn’t violent but still provides the hard to imagine situations you hope you only encounter in the pages of a book. 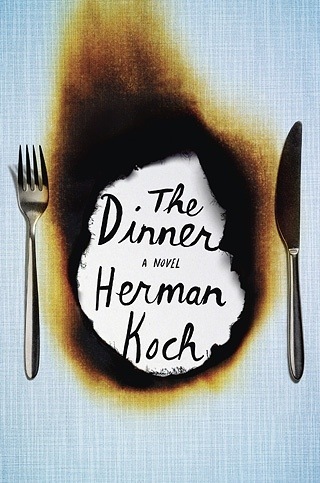 Thanks to Kayleigh at Random House for asking me to read an review The Dinner by Herma Koch. The paperback edition was released October 28th and back in February The Dinner was named as one of Amazon’s Best Books of the Month.